If eyes are the windows to the soul, then eyebrows are most definitely the curtains! I was pondering this to myself one day browsing the heady selection in Brown Thomas on Grafton Street in Dublin, when, out of the corner of my eye.....a revelation! The Shu Uemura Beauty and Lash Brow just popped into my vision, and I had a mental high five with myself. I was looking for a good tweezers, but did I have a good shape? So, killing to beauty birds with one stone I decided to glean some of the girls expertise. The main premise is that the girls measure your eyebrows according to your face shape, and features. They use little rulers and mirrors to show you where your brows should start and end, and then they shape them for you, all for €20. So there I was sitting in the middle of Brown Thomas, with pencil lines all over my forehead and eyebrows......mortification or wha'? Sarah (my therapist) kindly explained to me that my eyebrows were too far away from the bridge of my nose, and one side was kindof wonky (my words, not hers!) Sarah also told me where my arch should be and where to pluck underneath it to emphasize the shape. She was absolutely lovely as she told me not to remove any more hair on the inside of my eyebrows, and also to let them thicken out a bit to achieve the stronger brow look, especially for nightime. In the end, she filled them in using the special Shu Uemura Hard Formula Eyebrow Pencil in hard 9, which really finished the shape, and filled in the sparser hairs destroyed by years of over-plucking. When using the pencil she said feather it from the middle of the brow down to the edge first, and then work the pencil from the inside edge out, using light strokes. I did buy the eyebrow pencil, because I used to just use brown eyeshadow and an angle brush, and wanted to try something new. It costs €19.95 and is well worth it. The final result was gorgeous, and I couldn't wait to get out there and try it for myself. Altogether, It was a great learning experience and Sarah even threw in a few Shu Uemura samples for me too. The pencil itself is as big as a regular pencil, which is longer than most eyebrown pencils, about one and a half times bigger than a Rimmel one, so that in itself is a bonus. The first time I used it I was surprised at how buildable the colour is, it starts out very light, but it really builds up with looking overly dark on your eyebrows. 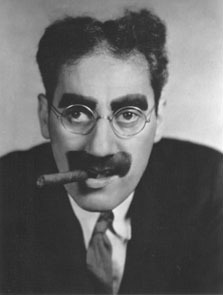 Groucho Marx....no thanks!! 1. Let your eyebrows grow out a bit. I wish I had let mine go a bit wild for a while, so that she could really shape them properly. 2. Be prepared for a sales pitch, leading questions such as "What moisturiser do you use" What is your regular skincare routine?" And such, answer politely, but don't get suckered into buying more than you want. 3. Prepare for a little pain, after all it is tweezing!